If you live in Southern California and you have never dropped by the Lux Art Institute in Encinitas, you are missing a great opportunity to see contemporary artists at work. At the Institute's hilltop pavilion noted contemporary artists develop new works in front of visitor's eyes, making their studio practices public. 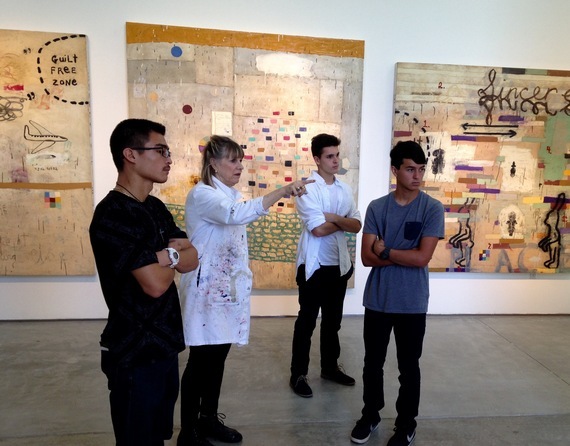 On a recent afternoon I took some of my summer school art appreciation students to the Lux where Squeak Carnwath, a former UC Berkeley art professor wearing a paint-smudged white lab coat, greeted us warmly, ready to show us what she has been up to during her residency. At the north end of the pavilion, next to recently finished paintings, we got a feeling for how she sets up her working space. 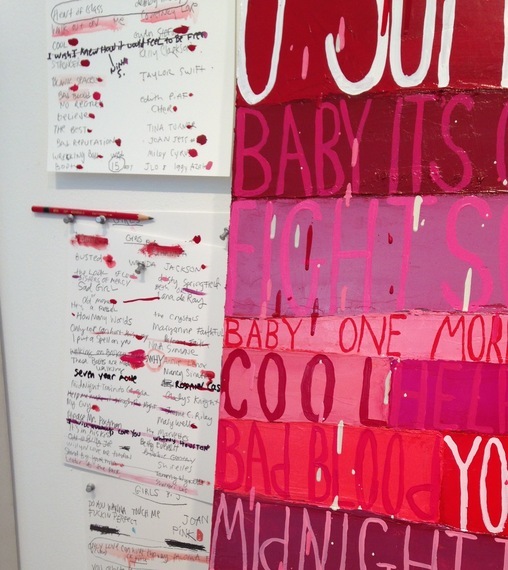 Carnwath had left what she calls her "crazy" notes pinned to the wall. In both pencil and oil paint they displayed both practical working notes, lists of names and song titles, and some ruminations. As she visited with my students Carnwath talked about her painting methods, showing us samples of some her colors while discussing their qualities, and also offering some wise observations. She told us that "Art is the last frontier of getting to do what you want to do the way you want to do it." Carnwath also explained to us that her works are not exactly diaristic, although they do often contain notes, quotes and reflections. At the Lux she has been working on "Song" paintings that contain song titles wedged into vibrant strips of color laid on each other like bricks. One large painting titled "Ray" is dedicated to the late Ray Charles. A smaller lyric-filled 30 x 30 inch canvas is titled "Little Girls." Some of Carnwath's "Crazy Notes" for a recent painting. Carnwath's paintings have some the feeling of hand-painted signs, jammed together into a dazzling array. Interestingly, Carnwath told me that she does not write poetry, even though the words in her paintings often have a poetic effect. 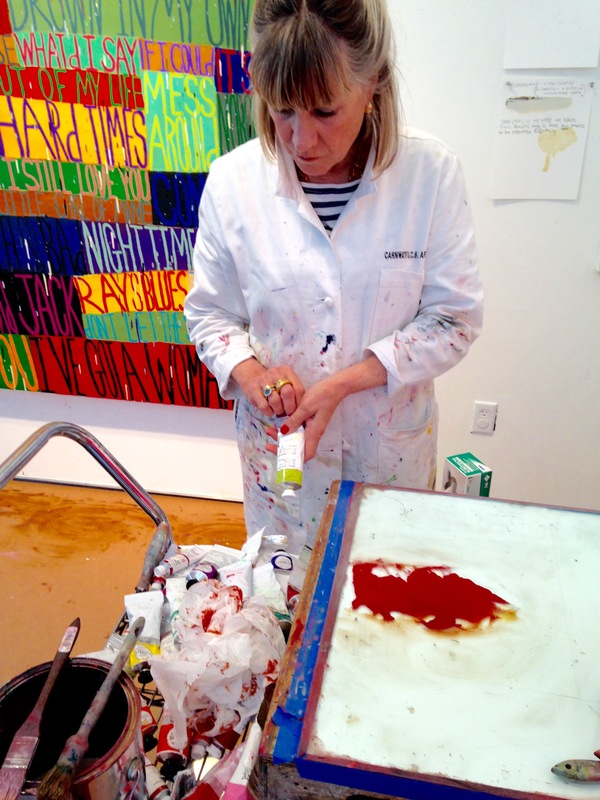 Her "Song" paintings have impasto surfaces and the directness and physicality of Carnwath's paint application is part of the work's appeal. 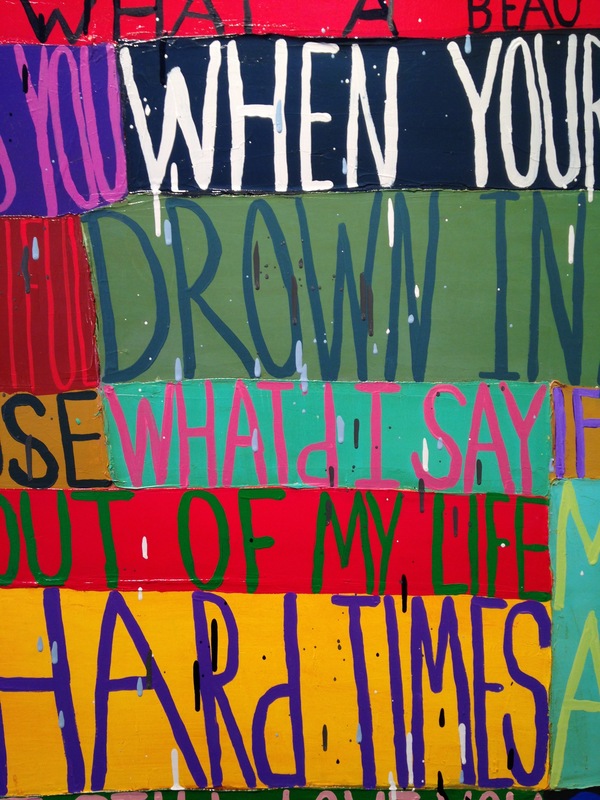 A detail of Squeak Carnwath's painting "Ray"
When I noticed a group of maybe ten painted cigar boxes on a table Carnwath opened one up for me, revealing a gloppy symphony of paint. 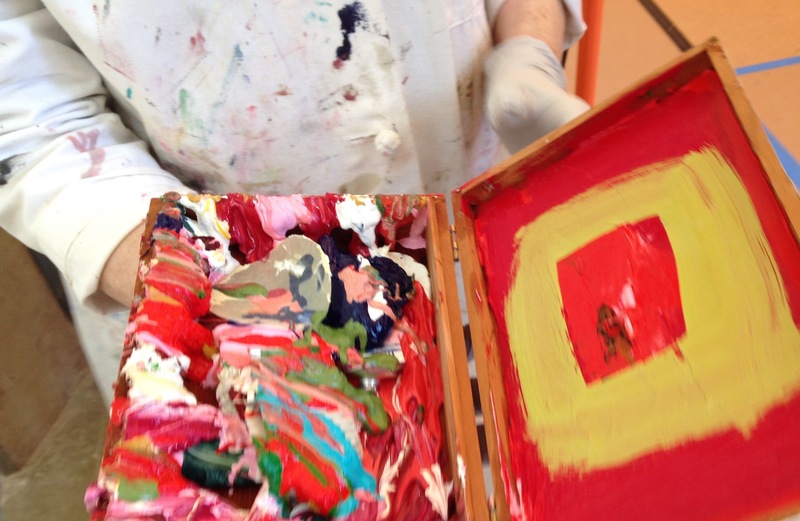 She explained that this was a way of recycling some of her paint scrapings, and that the boxes made nice gifts. For my students, who so often come back from gallery or museum trips feeling intimidated by the presence of solemn museum guards or snobby gallery attendants, the trip to the Lux was refreshing. There really is nothing like walking into a working artist's studio and getting a personal tour, and that is exactly what Squeak Carnwath and the Lux offered all of us. It was a warm, welcoming and inspiring experience.